Posted On January 15, 2015 by Team iCynosure. The Tata family is moving from strength to strength. The household market they've taken conquered with Tata Salt and Tata Tea among other products, the hospitality industry they've floored with the Taj Group of Hotels, the luxury sector they've amazed with Tanishq and Titan. And the group is all set to storm into the Automobile industry; first with the Zest and now the Bolt. 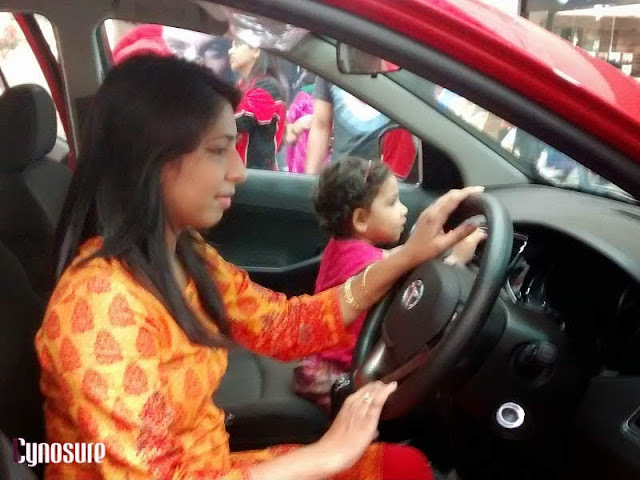 Last year when Tata invited Bloggers for the unveiling of the Zest in Goa, we all took one look at the car and saw a world-class product from the house of Tata Motors. With Zest’s amazing success story, the sedan has been followed up by a classy hatchback, the BOLT. You will ask what a BOLT is. Some may describe it as a part of the lock that engages or withdraws from it with a key or a screw that fastens into a nut or a lightening accompanied by thunder. Well for different people the same thing is very different. However one thing for sure is that the BOLT from the house of Tata Motors will mean just one thing for anyone and everyone; PERFECT. You wonder what, you wonder how, you wonder why? Most FASHION conscious people like everything impeccably, everything that makes a statement and the Bolt doesn’t disappoint… Just like it’s inspiration the Zest, the Bolt has been accentuated with the DesigNext exteriors right from the sleek stylish body to the perfect shape and placement of the lights. The projector lamps and the smiling grill along with the Floating roof makes the vehicle look more alluring. Those who prefer inner BEAUTY over everything else, the Bolt has so much substance on the inside you sure are to be immensely surprised. The Bolt is infused with the ConnectNext infotainment system by Harman not just like the Zest, but a step ahead. Apart from the Voice commands, sensors, and an amazing music system, the Bolt is also enriched by voice navigation. Apart from the infotainment the interiors with ample leg room and rugby shoulder seats is a hit that’s unmistakable to miss. Move over fashion and beauty, LIFESTYLE takes center stage here. With the DriveNext feature, all lifestyle enthusiasts will love the Bolt. Similar to the Zest, the Bolt offers a Multi-Drive feature that takes you from one mode to another in just a click of a button. Set at the City mode by default, the 1.2 Revotron petrol engine helps achieve it’s peak at 1500 rpm. Go Ego mode for a more fuel-efficient ride or go Sport when you want to race against the wind. Experts who are more interested in the TRAVEL and don’t care about anything other than safety and size in the same breathe shall be amazed with this lean machine. The Bolt comes with the 9th generation safety feature of the Anti-Lock Braking System by BOSCH, along with Corner Stability Control and Dual-Airbags. One of the best features of the Bolt is the collapsible rear seats that increase the boot space nine-fold, but also the fact that the same can be used as a neat bed-space for overnight travels. Oh no, still not sold on the Bolt. Worry not. For all those AUTOMOBILE and TECHNICAL junkies the Bolt gives you the best of both the worlds; Petrol and Diesel. The petrol offers a Revotron 1.2T Engine with a 90 PS@5000 RPM Max Power and 140 Nm@1500-400 RPM Torgue along with a Gear Box Speed of 5 MT. The Diesel on the other hand offers a Quadrajet 1.3L Engine with a 75 PS@4000 RPM Max Power and 190 Nm@1750-3000 RPM Torque along with a Gear Box Speed of 5 MT. The vehicle dimensions of LxWxH is a standard 3825x1695x1562 mm fitted either with Steel Tyres of 175/65 R14 or Alloy Tyres of 175/65 R15 and a Electic Power Assist Steering. All of that at an amazing price. You think I’m presuming too much? No I’m not. Given the way the super-powered Zest was priced, the Bolt will be in a much more competitive position from its competitors not only with it’s world-class technology but also with it’s price mechanism. So whoever you are, there is something that’s perfect for you. in the Bolt, and all those individual perfects the Bolt becomes a bigger and better perfect. That car is so cute.